An internal investigation into the death last month of an inmate at the Blaine County jail leaves little doubt that the man intentionally took his own life. Blaine County Sheriff Gene Ramsey released a copy of the final report regarding the death of 23-year-old Mitchel Wayne Christensen to the Idaho Mountain Express on Monday. According to the report, Christensen hid his suicidal intentions from jail staff and a medical examiner. However, his intentions to take his own life can be found in two notes—one to his girlfriend and the other to his family—that were found on his bunk in Cell Block 500 after Christensen jumped head first and fell more than 13 feet from a second floor railing onto a concrete floor. The report also states that surveillance video of the jump shows that Christensen was not pushed but acted on his own and made the leap almost immediately after jail staff entered the cell block to get him off of the rail. The investigation is not officially closed, as Ramsey waits for a report from an external investigation conducted by the Jerome County Sheriff’s Office. However, Ramsey said Monday that it is impossible to arrive at any conclusion other than suicide. Christensen died Saturday, June 14, at Saint Alphonsus Regional Medical Center in Boise after the incident at around 8:50 p.m. the day before. According to the report, he suffered severe head and spinal injuries and was unconscious when jail staff and EMTs arrived to provide assistance. Christensen had only been at the jail since June 12, having been arrested in Twin Falls on a Blaine County warrant charging him with failure to appear on a felony grand-theft charge. 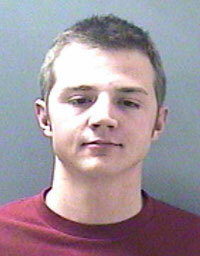 He was also a suspect in several pharmacy robberies in southern Idaho and Utah. Christensen was placed initially in a private holding cell and kept under surveillance until after a court appearance the morning of June 13 on the failure-to-appear charge. He was placed with the general jail population in Cell Block 500 later that day after being evaluated by the detention center nurse. The report further states that no family members who contacted the detention center regarding Christensen prior his jump from the rail made any mention of suicidal intentions. Also, the report states that only one of 11 inmates who were interviewed about Christensen had any concern about his mental state, and that one inmate stated that Christensen was despondent but seemed to be feeling better after the two of them talked. The inmate did tell investigators that Christensen was worried about the charges pending against him and about the possibility of a lengthy prison sentence.